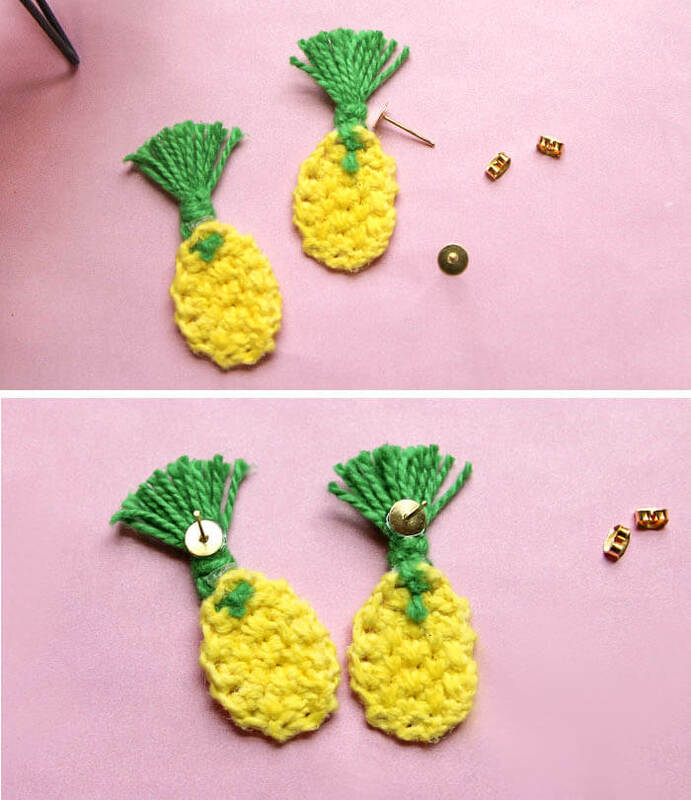 Make your own mini Crochet Pineapple earrings or pins! 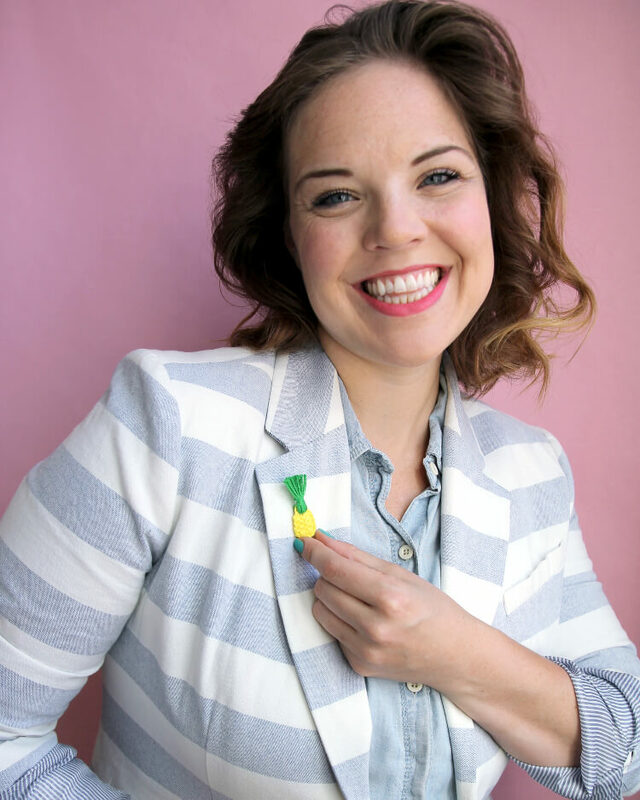 This free crochet pineapple pattern will let you make adorable pineapples in different sizes for itty bitty all the way up to big and chunky. I originally shared this pattern on the Darice blog, and this post may contain affiliate links, which help to support this site. Thanks! 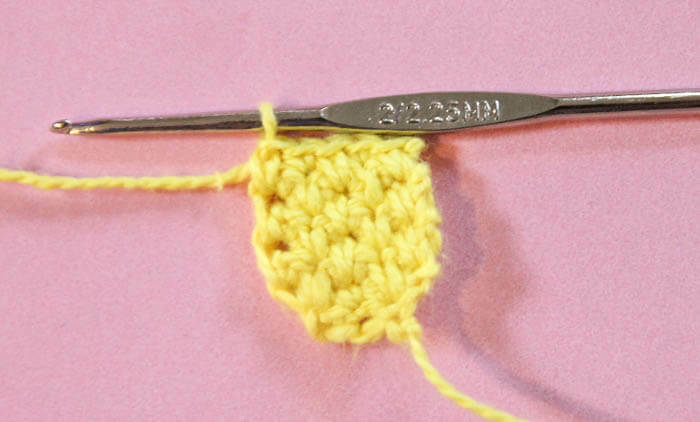 I have an itsy bitsy, teeny weeny yellow crochet project for you all today! This is actually my second pineapple crochet pattern, but this one is so mini and cute, and I just extra love it. 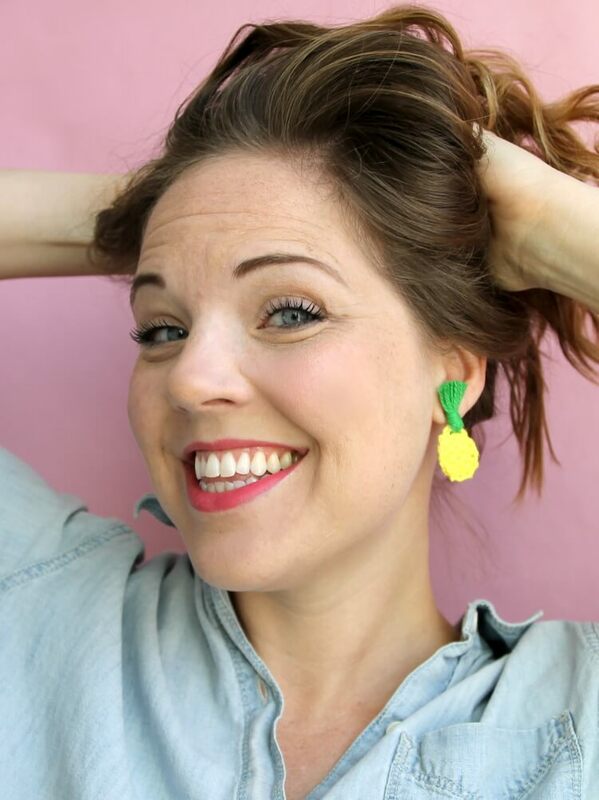 I used my tiny crochet pineapples to make earrings and a pin, but they have loads of potential for other projects, don’t you think? I’m thinking hair clips, note cards – so many possibilities! What do you think? Too crazy? They are a little on the wild side, but I think they are pretty cute. The little upside down tassels are my favorite. Want to make your own? You just need a few supplies and less than an hour and they can be yours! 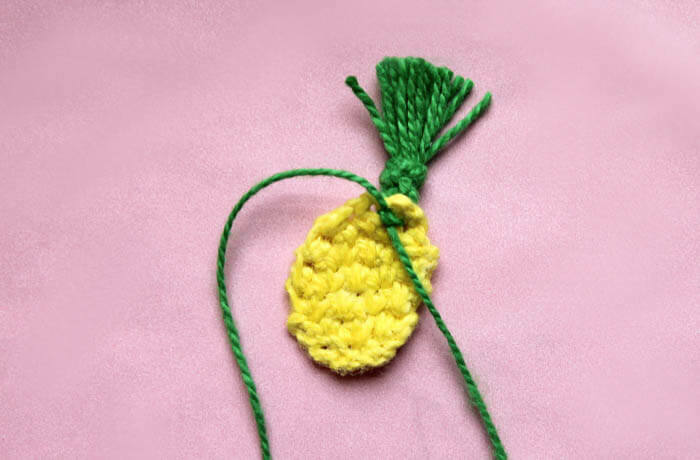 My Mini Crochet Pineapple pattern is free for personal use. You may sell items that you make from the pattern as long as you include a link back to the pattern when possible. Please do not sell or redistribute the pattern in anyway. If you want to share the pattern with a friend, please just send them a link. Thanks! 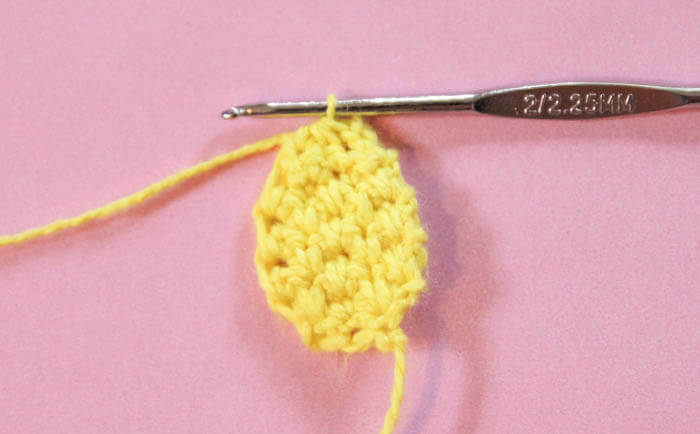 Using a 2.75 mm crochet hook and yellow embroidery floss, follow the crochet pineapple base pattern. 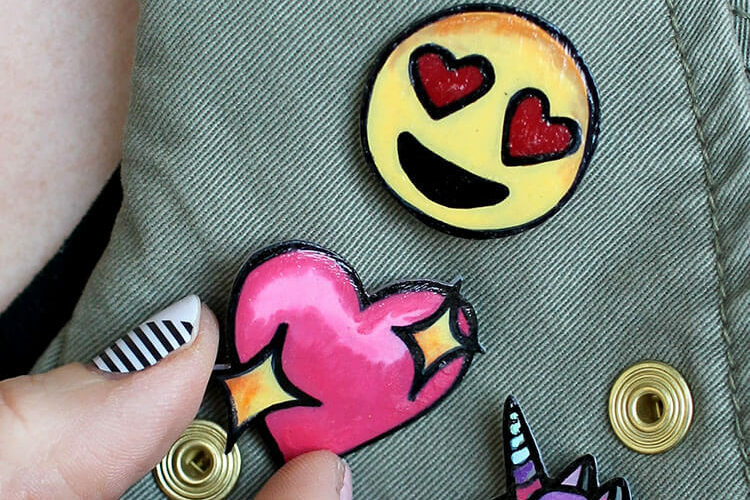 You will need to make one for a pin and two for earrings. Row 1. Ch 4, skip one ch, and sc in each of the remaining three chs. Row 2. Ch1, turn. 2 scs in first st, sc in next st, 2 scs in final st (5 scs). Row 3. Ch 1, turn. Sc, work sc into base of next st (spike st formed), sc, spike st, sc. Row 4. Ch 1, turn. Spike st, sc, spike st, sc, spike st.
Row 5. Ch 1, turn. Sc, spike st, sc, spike st, sc. Row 6. Ch 1, turn. Spike st, sc, spike st, sc, spike st.
Row 7. Repeat Row 5. Row 8. Repeat Row 6. Row 9. Ch 1, sc next 2 sts together, sc, sc next 2 sts together (3 sc). Row 10. Ch 1, sc next 3 sts together (1 sc). Finish off, weave in ends. The tops of the pineapples are just tiny upside down tassels! Love them! 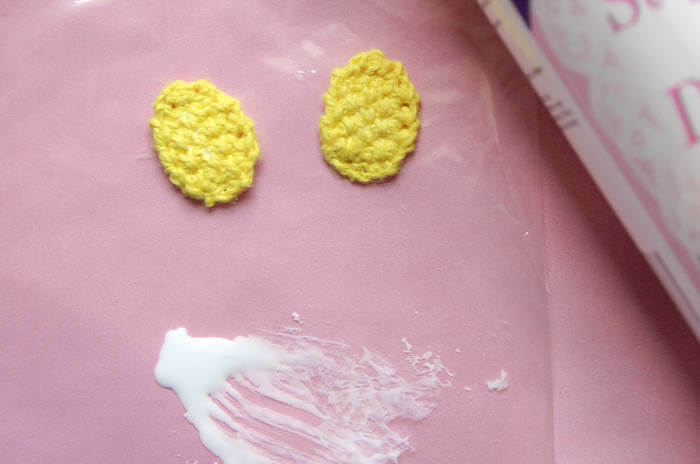 And – bonus – they are super easy to make. Start by wrapping the green embroidery floss around three of your fingers 9 times. Clip off a piece of embroidery floss about 4 inches long, thread it through the loop and tie a double knot on top. Cut the loop open on the bottom. Snip off another length of thread – about six inches long. Wrap it several times around the tassel about a quarter inch below the double knot at the top. Secure it with a double knot, and clip off the excess. 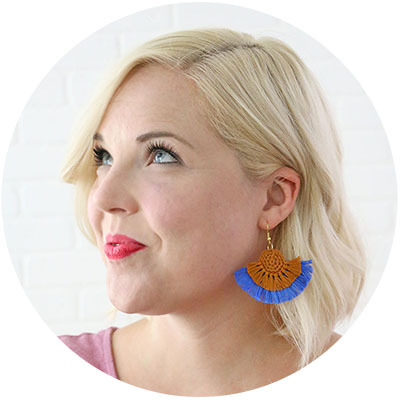 Finally, trim the tassel to the length you want. My tassels were only about three quarters of an inch long when finished. To make your pin or earrings to be a bit more sturdy, you can use fabric stiffener. All you need to do is pour a little bit out on a piece of plastic wrap and dip the back of the pineapple bases in the fabric stiffener. I chose to just do the back side of the base because I wanted the crochet fabric to retain it’s look and texture as much as possible. 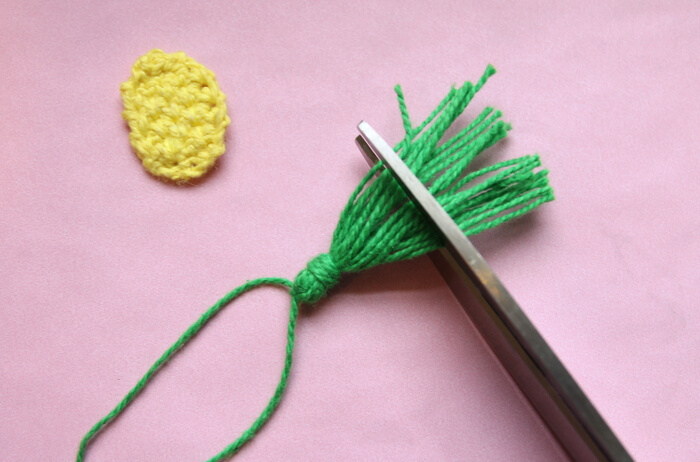 Using your crochet hook, pull the strings at the top of the tassel through to the back of the pineapple base. Tie in place, trim ends, and secure tassel in place with a dot of hot glue. 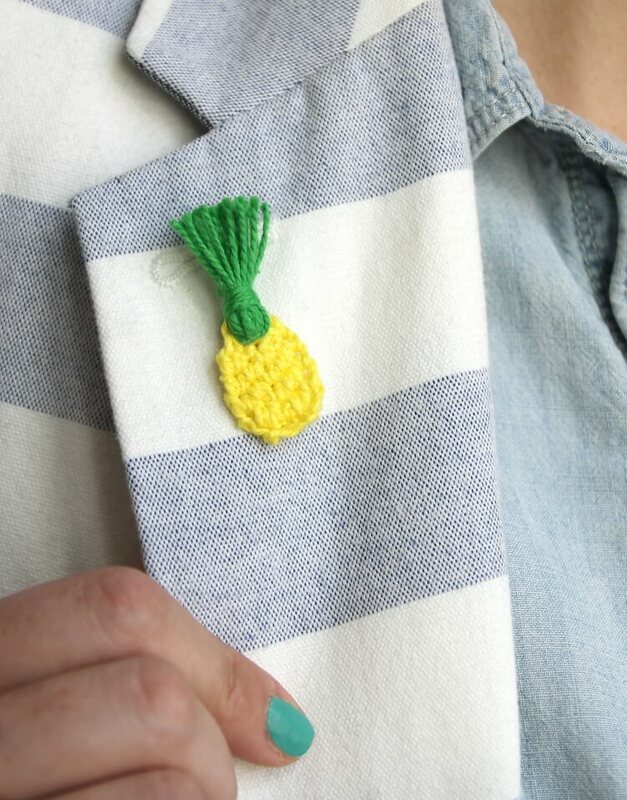 The last step is to simply glue the earring posts or tie tack to the back of your crochet pineapple or pineapples. Hot glue works great for this. I glued the posts to the base of the tassels for the earrings, and I glued the tie tack a bit lower for the pin. 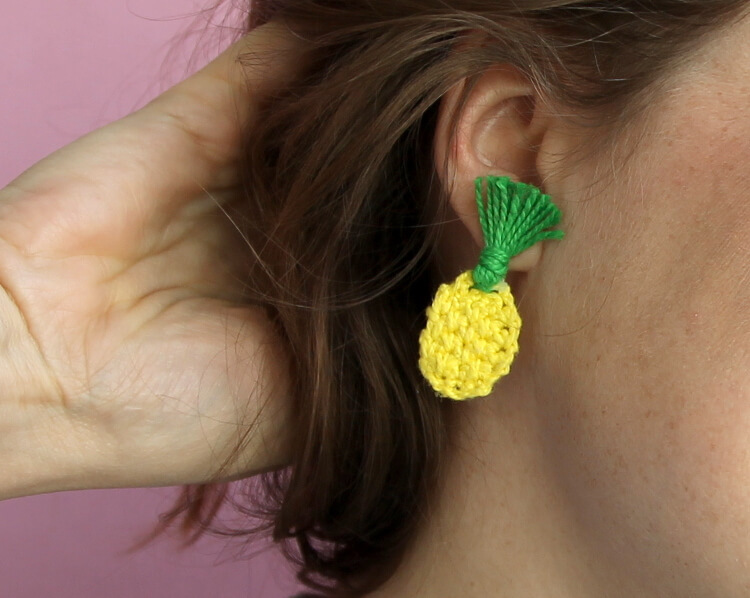 All that’s left to do is wear your fun new crochet pineapple accessories! What do you think? Would you rock the pin or the earrings? 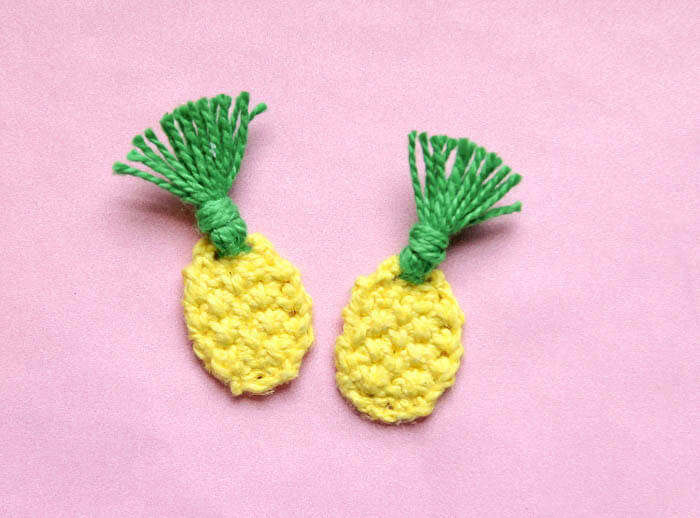 If you make your Mini Crochet Pineapple Accessories, I would LOVE to see them! Please tag me on instagram or share to my facebook page. 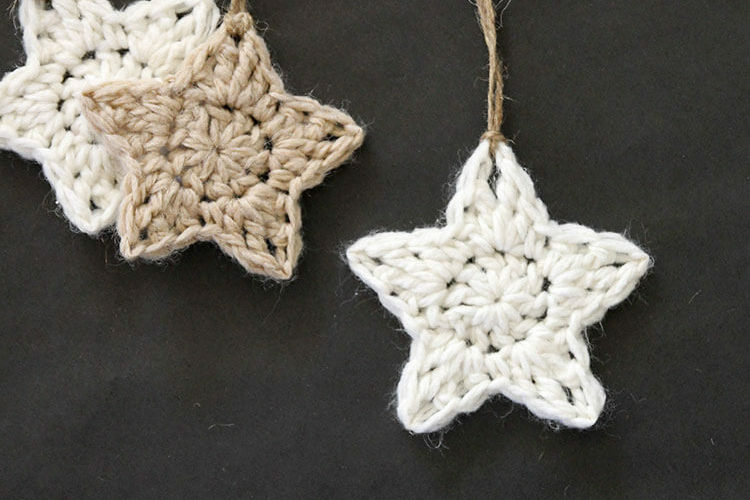 My daughter is learning to crochet this might be perfect for her to try. Thanks for the diy Alexis. Pinned & shared. Thank you so much! 🙂 I’m such a fan of yours. Love these cute pineapples! What kind of embroidery floss are you using? Could I substitute crochet thread? 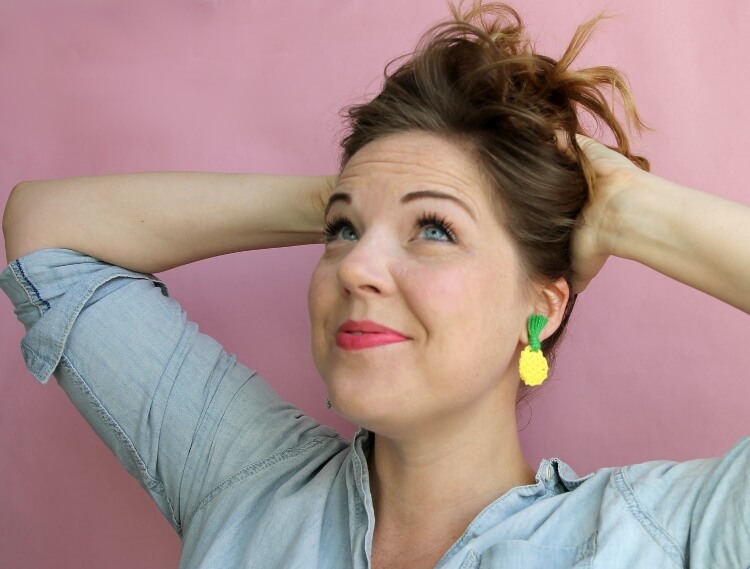 wow, found this site via pinterest and I loooove your pineapples! I wanted to share them on my Little blog, it is all linked back to yours – I just want to remember to do them. I am totally in love with pineapples, Flamingos, and succulents right now. and peacocks 🙂 Thank you veeery much for sharing!!! Thanks so much! I am always happy with sharing as long as it’s just a photo or two with a link back. 🙂 Have a great day! Hi, what is spike stitch?